Here in our little corner of the world, we are in the process of reorganizing, redecorating and upgrading each room of our house as we also prepare for the busy back to school season. We were well organized ten years ago before the births of our two younger daughters--but, now our home needs both freshened up and grown up to meet our big girl/tween daughters’ needs! Managing my two younger daughters’ growing collection of jewelry has driven me mad for years--but, solving the problem literally took less than five minutes with a hanging kid’s jewelry Cork Board Organizer. Why didn’t I do this 5 or 6 years ago?! 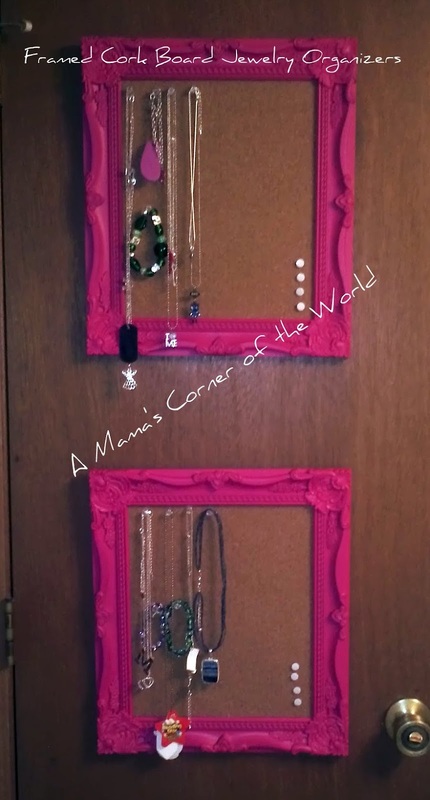 Choose an efficient space for the kid’s jewelry cork board organizer. If the board isn’t placed where the little ones (and even the older one too) will use it--any jewelry organizer isn’t going to help you keep your home neat and organized! We opted to use the bare space on the back of our daughters’ bathroom door. The girls can choose jewelry as they prepare for their day--and put jewelry neatly in place as they prepare for evening baths and bedtime. We gave our older daughter the top board--and our younger daughter the bottom board for easier height access. 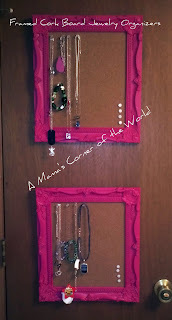 We are making use of wasted space--and the girls finally have functional storage for their necklaces and bracelets! 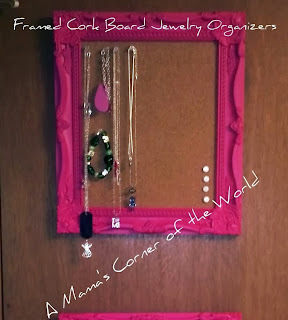 Cork boards are both easy to find--and to make. We opted for two small, decoratively framed cork boards that fit our desired space--and gave the girls individual storage. We found these two bright pink framed boards at our local Meijer store in the “off to college/dorm” section--and they were exactly what we wanted. 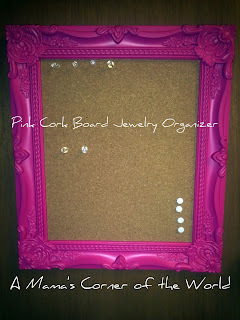 I was lucky enough to find the boards already made in the style and color that I wanted for the girls’ space at less than $8 per board during a special sale--but, I could have easily made a DIY cork board with a frame--like this one, available in a variety of sizes from Amazon, a store for which we are an affiliate…. and a roll of cork. 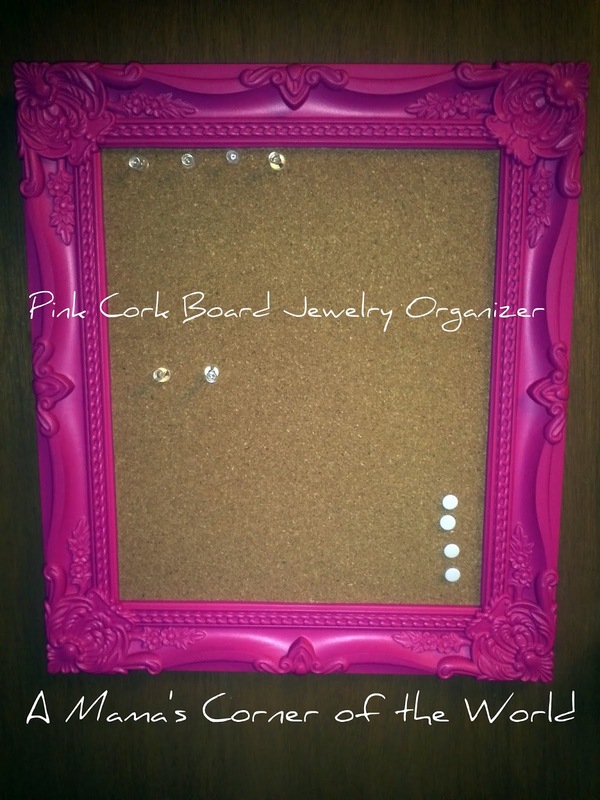 We've made cork boards for the office before by simply cutting the cork to fit inside an inexpensive photo or poster frame, removing the picture frame glass, inserting the cork and adding pins for storage--an easy five minute storage solution. Get creative with push pins. We currently have simple, clear office style pushpins holding the girls jewelry in place--but, I’m adding these brightly colored pin hooks that I think will do a better job of holding the jewelry when used by little fingers! 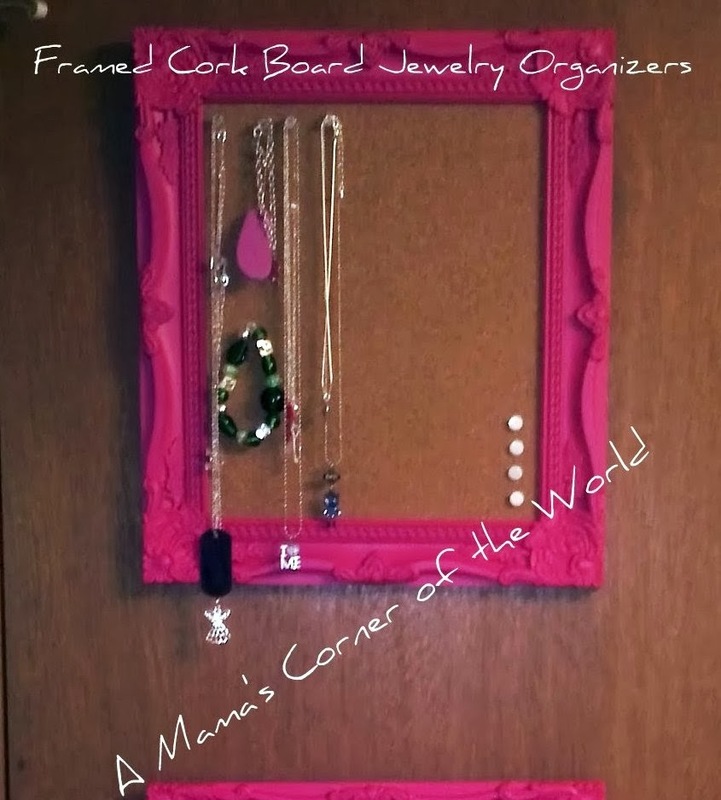 If jewelry storage for the kids is driving you mad--a kid friendly, jewelry cork board may be the perfect solution for you--it’s working wonderfully for us and the girls are wearing their fun jewelry so much more often now that it’s easy to access and put away! Disclosure: Some of our posts include affiliate links that may pay us a slight commission on products purchased through those sites. You will only find products in our posts that we recommend, use or would select for a project or problem solution regardless of affiliate links.